Front and Center, Public Television’s critically acclaimed concert series, will air the finale of its star studded eighth season on March 9th 2018. 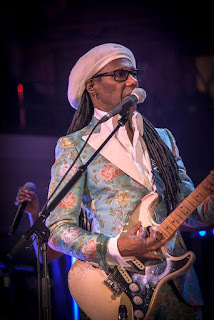 The episode features highlights from Nile Rodgers’ induction into the Songwriters Hall of Fame, performances of "We Are Family" and "Le Freak," as well as insightful storytelling about his songwriting process and an intimate performance from the McKittrick Hotel in New York City. View the trailer for this episode here: https://youtu.be/O8xOnx9H_k0. "Nile is respected and admired by his fans and peers alike not only for his multi-/cross-genre music, but also for his curiosity and eagerness to discover the next new wave of music,” said SHOF President and CEO Linda Moran. "It is most fitting that Nile kick off our new partnership with Front and Center as there is no one better than Nile Rodgers to get the message across loud and clear, with unbridled passion and extreme eloquence, that it all begins with a song!" "It’s an honor to partner with The Songwriters Hall of Fame and Nile Rodgers as part of the Front and Center series” said Executive Producer Don Maggi. “Nile’s show reinforces why he’s a musical pioneer and member of the Songwriter’s Hall of Fame. His passion, talent and unique ability to tell a story is on full display in this episode. It was our pleasure to work with Nile, Linda Moran and her team at the Songwriters Hall of Fame. We look forward to additional shows in 2018." Among music legends, Rock and Roll Hall of Fame inductee Nile Rodgers is truly exceptional. He amplifies his legacy as a multiple GRAMMY-winning composer, producer, arranger and guitarist by constantly traversing new musical terrain and successfully expanding the boundaries of popular music. As the co-founder of CHIC, Rodgers pioneered a musical language that generated chart-topping hits like “Le Freak,” sparked the advent of hip-hop with “Good Times”. His work in the CHIC Organization and his productions for artists like David Bowie, Diana Ross and Madonna have sold over 300 million albums and 50 million singles worldwide while his innovative, trendsetting collaborations with Daft Punk, Avicii, Sigala, Disclosure and Sam Smith reflect the vanguard of contemporary music. Season eight of Front and Center boasted an all new line-up of Grammy Award winners, Billboard chart toppers, CMA Awards winners, and emerging artists. The 10 new episodes included intimate performances from Liam Gallagher, Mike + the Mechanics, Beth Hart, Sheryl Crow, Seal, Jack Johnson, and Nile Rodgers as well as Miranda Lambert, Clint Black and a twin bill featuring Kane Brown and Luke Combs, as part of Front and Center’s ongoing partnership with the Country Music Association and the CMA Songwriters Series presented by U.S. Bank. All air dates and times are available here: http://www.pbs.org/show/front-and-center/.